Many argue that Manali-Leh Highway takes the cake when it comes to ‘grandness’ of scale and scenery, despite the route being tough on the body and mind. I agree to the latter. I found Srinagar-Leh Highway, also known as National Highway 1, to be an equal and not a contender in terms of the wow factor the landscape dials up once you hit the road. It’s also easy on your body as the roads are far, far better. 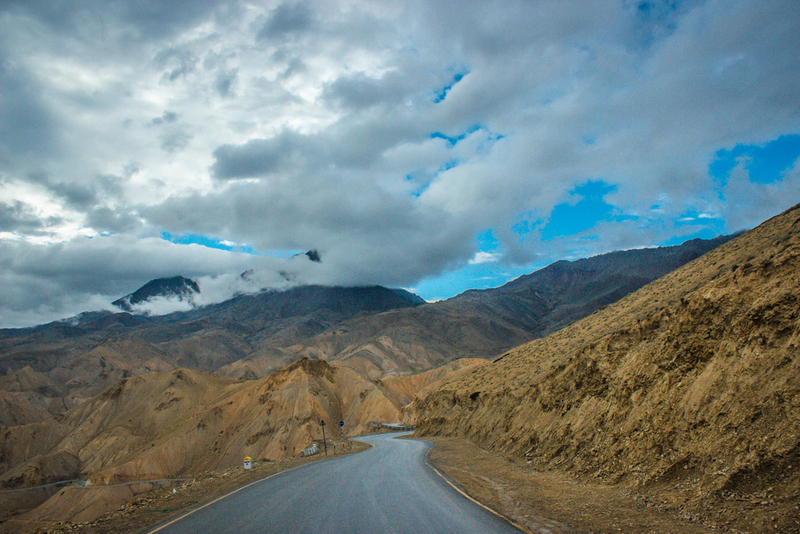 There are three high-altitude passes as compared to the five that are on the Manali-Leh Highway. More so, the passes on the Srinagar-Leh Highway aren’t as high as the ones on the Manali-Leh Highway. They’re still formidable, yes. Here’s a chart for comparison. There are three other things on which Srinagar-Leh Highway takes an edge over Manali-Leh Highway. One, the number of fuel pumps. The last fuel pump on Manali-Leh Highway is in Tandi, which is 367 kilometres before Leh; whereas the distance from Srinagar to Leh itself is 422 kilometres. Two, the number of places to stay on Srinagar-Leh Highway are not only more, but better. Three, if you ride or drive towards Leh from Srinagar instead of Manali, it helps you acclimatise better as the altitude gain is gradual. So which one should you choose depends entirely on what kind of travel you prefer. If you do not want to stress it out too much, you can prefer Srinagar-Leh Highway for a round trip. On a personal note, I would recommend travelling through both and not missing out on the thrills and adventures Manali-Leh Highway has to offer. Good weather has kept us company throughout and today is no different. The last leg of our journey begins with the sun shining bright. We bid farewell to Leh. A return soon is on the cards. Magnetic Hill is our first pit stop. The only thing I find magnetic about the place is how incredibly drawn people are to it. And the only thing I find gravity defying about it is how people would jump hoops repeatedly to get a decent picture. We did it too; just not here. Moving on, Sangam welcomes us with as beautiful a landscape as it can get. It’s the confluence of two giant rivers: Zanskar and Indus. It gets difficult to pick up your jaw off the floor again and again when the vistas keep getting the better of you. From the splendour of Nimoo and Saspol to the otherworldly setting of Lamayuru, The Moon Land, Srinagar-Leh Highway keeps offering something new at every turn. The roads are so good that Fotu La and Namika La are soon left behind without even realising that we are about to cross a high-altitude pass. As opposed to the bumpy rides up until now. The camera is kept busy. It has been quite difficult to not shoot everything in plain sight, including one stunner of a sunset. Night is about to fall now. We’re nearing Kargil already, out halt for the tonight. The ride today has been immensely smooth. I wonder if Kargil War Memorial would have had the same impact if we had visited it in the first leg of the journey. It has been a little over two weeks for everybody since they saw their family. Network connectivity has been poor and unavailable for few days at a stretch. The altitude has gotten the better of each one of us at least once at some point or the other. We have fought no wars, not even battles. Maybe this is why it makes us all swell up a little as we pay our visits and respect to the fallen ones. Acknowledging, maybe, in a better way than before on what amount of superhuman strength, both physical and emotional it must have taken for our soldiers to end a war they didn’t start. Thankful and honestly, a little touched, we hit the road again. Dras has been as beautiful as Zoji La is going to be daunting. The roads, at several stretches are in bad shape, made worse by rains and landslides. A JCB machine is trying to clear up debris midway and there’s traffic piling up. Not for too long though. Descending from the nightmare of a highway (just around Zoji La) into the land of golden meadows, Sonamarg has been breathtaking. It’s my second visit to Sonamarg in less than a month. We stop for lunch and the Mirchi Korma (of Wazwan) has everybody chewing their hands off. There’s still good amount of daylight left so we decide to reach Srinagar by the end of it and cosy up in a houseboat, buying souvenirs from the Shikara walas whilst savouring hot cups of Qehwa. It feels like savouring memories instead, sip by sip. Memories from more than the two weeks that have gone by! Kargil War Memorial. Mount Tololing in the background. Kargil War Memorial. Tiger Hill in the background.